Reading the chatter online about this second cookbook from the Sprouted Kitchen team, Bowl and Spoon, has been really affirming for me, despite not having contributed one crumb to this lovely book. It’s really been great mainly because everyone chimes in about how much we all like eating from bowls. I’m not alone! In fact, there are dozens of us! But seriously. Bowls. You can hold it in one hand, shovel with the other, and reasonably eat on the sofa. What else could you want? 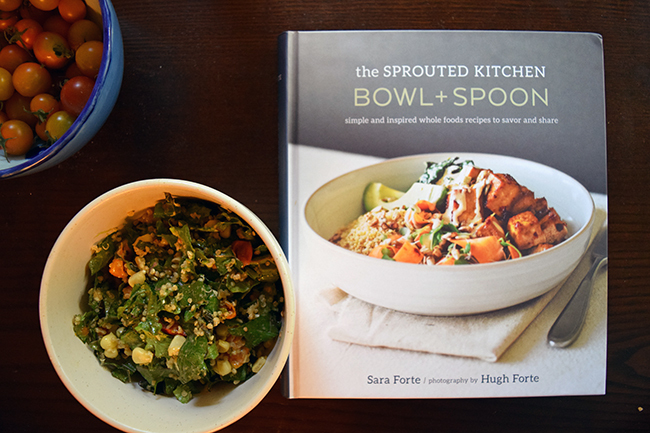 The book’s schtick is “bowl food,” and while the definition of that is stretched a bit (I mean, anything is bowl food if you want it enough), it’s a nice homey aesthetic. There isn’t any alchemy in this book — no warping of kale into cupcakes or anything — but that’s kind of the point, I think. It presents straightforward but fresh recipes using wholesome ingredients that don’t try to be something they are not. Other than an appreciation for the best food vessel, I also resonate with Bowl and Spoon‘s celebration of salad. I know that sounds super lame and sad, and it’s a total 180˚ turn from my stance a few years ago of, “No salad as a meal.” I don’t know, I’m old now, and my body wants vegetables, and also, I now know what I want as a meal salad. 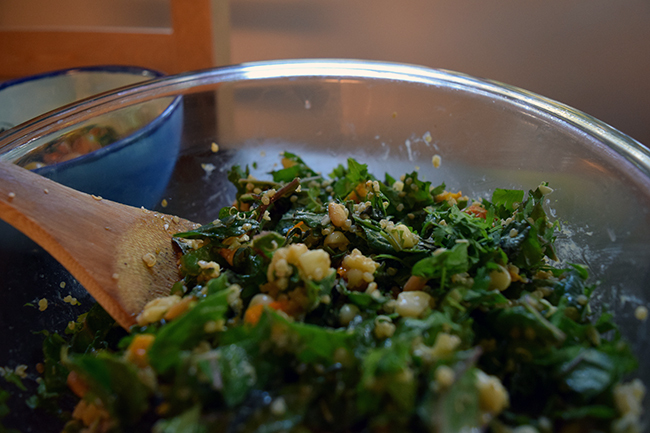 It’s got to have two of the three: hearty greens, something warm, and some whole grains or legumes. (Please don’t feed me a side salad as a meal.) Sara Forte understands this, and this book’s got a bunch of filling but fresh salads I’d happily enjoy as a meal. 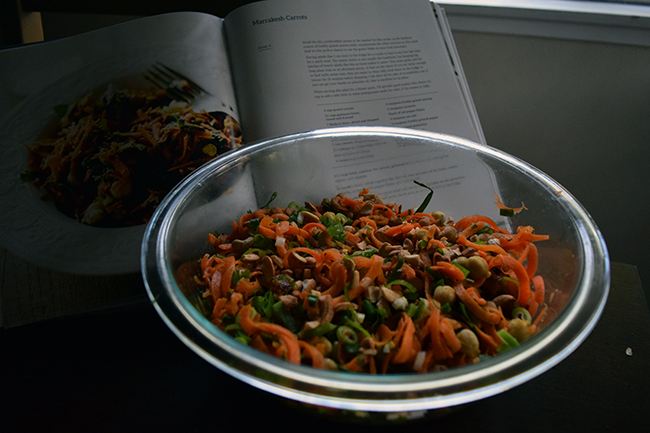 I prepared two of these: the Summer Quinoa Salad, and the Marrakesh Carrots. They were both salads to savor with great flavors and a variety of texture. They take a little more time to throw together than a quick side salad, but honestly, on two consecutive hot days, I happily ate a double portion of one, and then the other, as my dinner. They also kept well in the fridge for a few days. 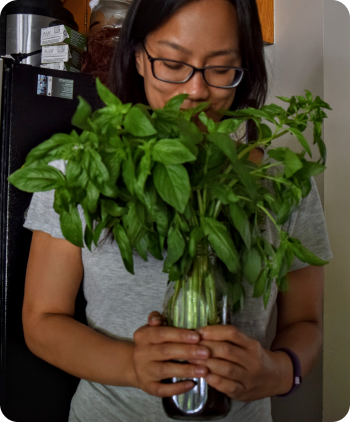 When you find a salad that’s a satisfying meal and also doesn’t totally die in the fridge, you hold on and never let go, you guys.